These Childs Pirate Pants make a great addition to your childs pirate outfit. If you are going for more of an authentic look, these pants will be perfect! Pair our Childs Pirate Pants with a pirate shirt, scarf, and hat, and you are all set. 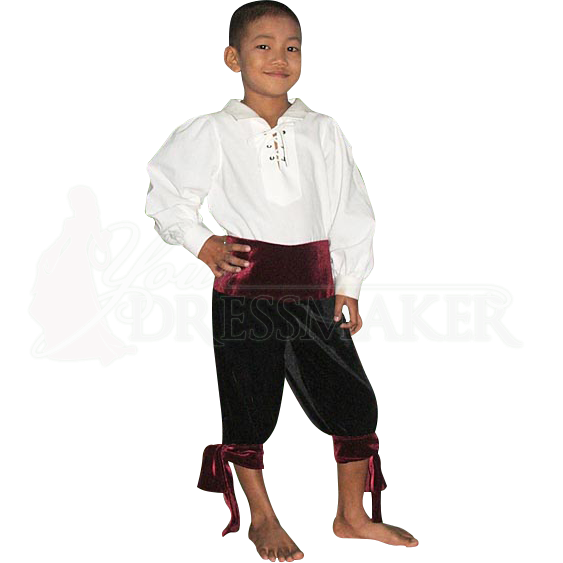 These Childs Pirate Pants are made of a royal velvet fabric and come in a variety of color combinations. These pants are similar to breeches, the are meant to go down just below the knee. These pants have a wide waistband and the matching trim that ties at the cuffs. Whether you just want to out do everyone this year for Halloween or your child has a special event coming up, our Childs Pirate Pants are an excellent choice. When ordering, the first Color dropdown menu is for the main color of the pants. The Accent Color is for the trim at the waist and cuffs.